In this article I will show you some examples of autoyast xml files and syntax which can be used based on your requirement. 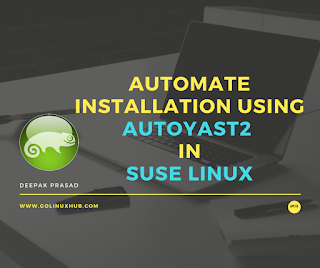 AutoYast2 xml in SLES is similar to kickstart used with Red Hat only in terms of concept which means both of them are used for automating the installation but the syntax and variables used are completely different. AutoYaST2 is a system for installing one or more SUSE Linux systems automatically and without user intervention. AutoYaST2 installations are performed using an AutoYaST profile with installation and configuration data. That profile can be created using the configuration interface of AutoYaST2 and can be provided to YaST2 during installation in different ways. General options include all the settings related to the installation process and the environment of the installed system. The mode section configures the behavior of AutoYaST with regard to confirmation and rebooting. By default, the user must confirm the auto-installation process. This option allows the user to view and change the settings for a target system before they are committed and can be used for debugging. confirm is set to "true" by default to avoid recursive installs when the system schedules a reboot after initial system setup. Only disable confirmation if you want to carry out a fully unattended installation. With halt you cause AutoYaST to shut down the machine after all packages have been installed. Instead of a reboot into stage two, the machine is turned off. The boot loader is already installed and all your chroot scripts have run. final_halt and final_reboot have been introduced with openSUSE 11.0 and SLES11. You can reboot or halt the machine after installation and configuration are finished at the end of stage 2. YaST will keep network settings created during installation (via Linuxrc) and/or merge it with network settings from the AutoYaST profile (if defined). AutoYaST settings have higher priority than already present configuration files. YaST will write ifcfg-* files from profile without removing old ones. If there is an empty or no dns and routing section, YaST will keep already present values. Otherwise settings from the profile will be applied. To configure network settings and activate networking automatically, one global resource is used to store the whole network configuration. To understand more on every syntax used here you can follow the Guide from SuSE. By adding scripts to the auto-installation process you can customize the installation according to your needs and take control in different stages of the installation. In the auto-installation process, five types of scripts can be executed and they will be described here in order of "appearance" during the installation. All scripts have to be in the <scritps> section. echo "This is a dummy pre script"
echo "This is a dummy post script"